This web site and the articles and videos posted here are for the purpose of helping and providing information to you…the float tube/fly-fishing enthusiasts. 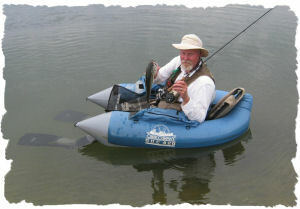 We will be discussing the issues involved with fly-fishing from float tubes and pontoons. The site will provide tips to help you put more fish in the boat; which flies will work in certain situations for various fish species as well as instruction on how to tie some of the most used and successful flies. We will also discuss rods, reels, fly lines, leaders, tippets and other facets involved with fly-fishing for your favorite catch. If you love to fly-fish from a floatable…then jump in and get ready for some success and lots of bent rods. Jeff’s Fishing Adventures – A brief recap of Jeff’s fly fishing trips. What worked, what didn’t and why! Fly Fishing Tips – All kinds of tips about casting and hook-setting techniques, fly-tying, advice on using float tubes and other crafts and many more areas of interest! Destinations – Jeff’s recommendations for places to go to for an enjoyable fly fishing trip! Video Tips – You will find various “how to” tips in many of Jeff’s videos that will help you do things to make your fly fishing exploits more enjoyable. Search For Additional Information – Please use the ‘Search Box’ in the header if you need to find have specific information. Questions for Jeff – If you have questions about anything involved with fly-fishing, feel free to drop Jeff an e-mail at flyfishingwithjeff@gmail.com.